Common Management Admission Test (CMAT) is a National level test which is conducted via online mode. 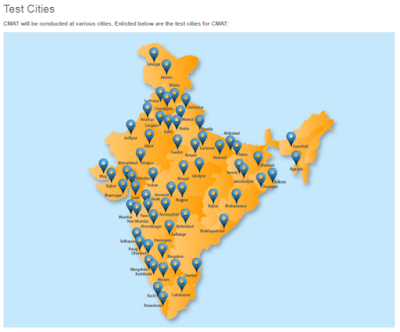 This year CMAT 2019 is scheduled to be held in the month of January 2019 in 74 cities across country. Around 59000 candidates appear in CMAT every year. Selected candidates can take admission into PGDM, MBA, PGCM, Executive PGDM courses. All AICTE-Approved Institutions, colleges & universities consider the AICTE CMAT score card for providing admissions in their Academic Courses. All the AICTE approved institutions are given merit list prepared by AICTE. Qualified candidates are then called for the Group Discussion (GD), Personal Interview (PI) or Written Ability Test (WAT) rounds after which final result are announced. You can get more details about CMAT 2019 exam date by going through this page completely that is designed by the team of www.privatejobshub.in. Candidates, who are citizen of India, need to possess Degree of Graduation in any discipline from recognized university or institution with good academic records. Those aspirants, who are studying in Final year Graduate Courses (10+2+3) and whose result will be declared before commencement of admission for academic year 2017-18, are also eligible. You may also go through this CMAT Eligibility Criteria 2018 for complete details. Qualified candidates may grab opportunity to get admission into CMAT 2018 Colleges. Aspirants, who are willing to pay fee, may follow any of the below stated mode to apply. Interested candidates can select Online Payment mode to pay fee and through this mode you need to use Credit card / Debit card / Net Banking. After submission of fee, you can receive a confirmation E-mail and SMS. After getting the successful payment confirmation, you may go for the rest process. Interested candidates may choose mode to pay by CASH at any of the designated SBI bank branch. Please take 3 Print Outs of this Challan, fill the required details and pay fee in nearest SBI bank branch. Cash Deposit will be accepted only from the next day of your Challan generation. Interested job seeker should visit to the official portal such as www.aicte-cmat.in. From the home page you need to select suitable link to read the complete notification. Go to NEW USER option and enter few basic details for CMAT 2018 Registration. After filling CMAT Registration Form verify filled details properly. You need to upload your scanned photo of size 140 x 160 (≤ 60Kb) and signature 60 x 90 (≤ 30Kb). Once you SUBMIT this page, you will get unique 6 digit password on your screen and via E-mail and SMS. Now you can Login is created and you can login to your account for completing further process of Registration. After reaching on home page hit on apply online tab. After details are filled in the form, all candidates need to pay required fee through proper channel as well stated above. Also, upload all required documents and certificates with the form. Recheck the filled detail and no change in data will be done after completion. Submit the filled details and take print out of filled application form for future use. Go through CAT Exam Pattern to get complete details about the Common Management Admission Test 2018 and prepare for CMAT Exam 2019 . CMAT 2019 will consist of 400 marks. Written exam will have 4 sections in total which candidate has to attempt. The exam will be computer-based and of objective type, i.e., Multiple Choice Questions (MCQs) along with few objective type questions. Each section will contain 25 questions of 4 marks each which account for 100 marks for each section. Examination will contain Qs based on topic given in CMAT Syllabus. There are so many topics under Quantitative Techniques & Data Interpretation like Number Systems, Fraction and Decimals, Geometry, Algebra and Work and Time etc; under Logical Reasoning like Analytical Reasoning, Statements Assumptions, Non Verbal Tests, Inferences, Statements Arguments, Linear Arrangements and Number Series etc; under Language Comprehension like Reading Comprehension, Para Jumbled, Sentence Corrections, Paragraph Completions, English Usage Errors and Sentence Improvement etc and under General Awareness like Politics, Literature, History and Geography etc. For better preparation of examination, you should take help from CMAT Previous Year Q Papers. CMAT Model Paper contains Qs that are asked in previous year examination. You can get idea of the pattern of Qs that are asked in examination. By this you can solve Q in examination in some time. CMAT Admit Card 2018 is one of the essential documents to be brought at time of examination. No one will get entry in exam hall without their Common Management Admission Test Admit Card. Also attach a passport size photo on your hall ticket while attending exam. It will be released in 3rd week of January 2018 on official portal. All the candidates need to download CMAT Result online from link given here. To download Common Management Admission Test Results, all the candidates need correct registration number and date of birth etc. As per CMAT 2018 Results, admission will be given in suitable medical programme. You can download results in 2nd week of February 2018. Merit List will be prepared on the basis of CMAT 2018 Cut Off Marks. Cut Off Marks depend on Difficulty of exam, Reservation norms, total Number of applications, available seats, Marking scheme. It would be released probably in 2nd week of February 2018. CMAT Counselling is conducted to offer admission to the deserving candidates in the courses of their choices such as PGDM, MBA, PGCM, Executive PGDM, etc. Seats will be allotted to the deserving candidates on the basis of their rank in examination. To attend Counselling, you should bring all essential documents with you. Answer Key are the only solution to get idea of marks in any exam. You should download Common Management Admission Test Exam Solution, to estimate marks in examination. It is made available on the official portal of organization for all Set A, Set B, Set C and Set D.
CMAT Entrance Exam is conducted by AICTE once in a year. Candidates have to apply via online mode to appear for CMAT, 2019. CMAT registration process will get started from the 2nd week of October 2018. After the final submission no correction & modification in the application form will be entertained. Final year students can also apply for CMAT, 2019. Duration of the exam would be of 3hrs. Q1: What is the mode to apply for Common Management Admission Test 2018? Answer: All the candidates can apply online by following above given details. Q2: When I can fill CMAT Registration Form 2018? Answer: Online registration process will start in second week of October 2017. Q3: What is the Application Fee for online registration? Answer: General and OBC category candidates need to pay Rs. 1400/- and SC, ST & PD candidates should pay Rs. 700/-. Q4: What are the modes to pay fee ? Answer: Fee can be paid through Online or Offline mode. Q5: How many times Common Management Admission Testis conducted in a year? Answer: Common Management Admission Test is conducted two times in a year. Q6: Is there any negative marking? Answer: For each incorrect answer one mark is deducted. Q7: I am pursuing final year graduation Examination, can I apply? Answer: Whose result will be declared before commencement of admission, are eligible. Q8: What is the age limit to attend exam? Answer: There is no age limit to attend Exam. Q9: Can I change do correction in my form after submitting it? Answer: There is no process for correction of filled Application Form. Q10: How much time is given to solve CMAT Question Paper? Answer: All candidates will be given 180 minutes to solve examination. To get other information about CMAT 2019 notification, please go through this Official Link. For latest update and news subscribe to our free mail service. You can also follow us on facebook and google+.